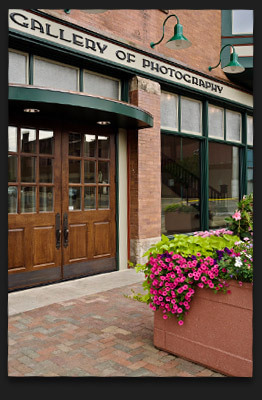 The Joseph Saxton Gallery of Photography is one of the country’s finest photography galleries and unique to Northeast Ohio. Galleries dedicated solely to photography are rare, let alone one of this scale. The gallery space is the result of nearly a year’s worth of renovations to the century-old A.H. Wilson Building (1909), which has now been designed for showcasing photographic works of art. The collection includes landmark pieces by more than 160 artists and spans the entire breadth and history of the photographic medium. From early dagguerotypes and tintypes to modern giclée prints, from Atget and Nadar to McCurry and Salgado, you will find it all here. Our Practices: We employ the strictest measures in curating and displaying our collection. Every piece we sell carries a sound provenance and has been photographed and carefully documented before being enclosed. Our enclosures are of the highest standards with 100% archival matting, mounting and sealing, and are glazed with quality glass, providing clarity and protection. Our windows have all been laminated with UV protective film to reduce wear on prints, while on display. A long time area resident, Tim Belden’s interest in photography began as a teenager, developing black and white prints. A student of creative writing and art history at Bowling Green and Cornell Universities, Tim opened his first art gallery – LeGallerie – in 1975. Tim’s current project is the Joseph Saxton Gallery of Photography. The goal of the gallery is to examine the entire history of photography in one physical location, a goal facilitated by the historic A.H. Wilson Building (1909) in which the collection is housed. Tim is very active in the Arts District, located in Canton's historic downtown and sits on the boards of the Canton Ballet, the Canton Development Partnership, the Special Improvement District, Indigo Ink Press, the Tie 1 On initiative, and About Magazine. Tim is the owner/operator of The Joseph Saxton Gallery of Photography, Tuscora Realty, and Nicole Press. Upon completion of her first two years in the E.W. Scripps School of Journalism, Ohio University, Maria took her first photography course as an elective. Three years later, she graduated with a Bachelor's Degree in Fine Art Photography. Since graduating, Maria has made her living both behind the camera and as a photographic retoucher. She has worked in the commercial photography industry and as a custom printer producing prints for clients such as The Pro Football Hall of Fame. She has also worked in digital photographic restoration, managed a portrait studio and owned a custom photographic printing business. Maria prepares exhibits and manages special events.